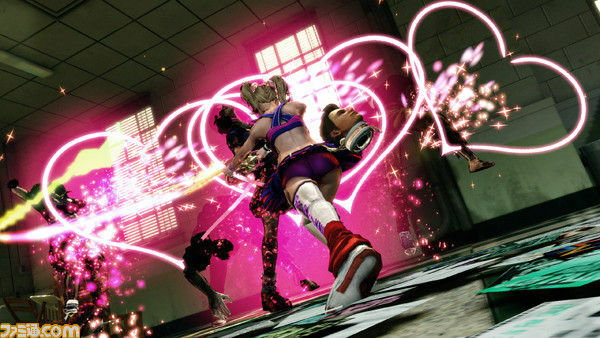 Here's what I know about Lollipop Chainsaw at the moment: It's being made by the folks at Grasshopper Manufacture (Contact, Killer7, No More Heroes ). It'll be published (in Japan) by Kadokawa Games. It'll be released for PS3 and Xbox 360. Oh, and it will star a chainsaw-wielding cheerleader and a whole lot of zombies. Oh, I guess this is where our paths diverge... I'm not a big fan of Suda 51 and their sense of humor. ;) Cool screens, though! I wouldn't put that past the folks at Grasshopper, Justin. (Putting Travis in this game, I mean.) I guess we'll find out soon enough! Anne: That's OK! I can't say I'm the hugest fan of Suda 51 -- I liked what I've played of No More Heroes, but that's all I've really experienced of his/their games. There are times when a combination of factors makes a game seem like a must-play. I think this is one of those times, at least for me! I've never played any Suda 51 games, but there's a first time for everything. I feel like there's no way I wouldn't have fun with this, if the screenshots are any indication. Hey there, Kamiwoo! Honestly, I could see it not being fun -- see the Onechanbara games, which look similar -- but I'm hoping that won't be the case. I mean, who wouldn't want to kill zombies with a hot-pink chainsaw? Oh man this game looks awesome when is it getting a western release? Hello, gamefreak! I would guess it will be brought to Europe and NA, but I don't think anything has been announced yet. Hopefully soon. And, YES, hot-pink chainsaw FTW!! !